Students from the University of Victoria (UVic) in British Columbia, Canada, are designing a tiny satellite with big aspirations. 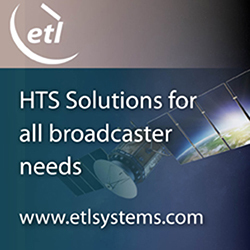 When a robotic arm on the International Space Station tosses the satellite into orbit in 2020, the satellite that’s no bigger than a two-liter carton of milk will become a vital tool to help astronomers and cosmologists better understand the origins and future of the universe. 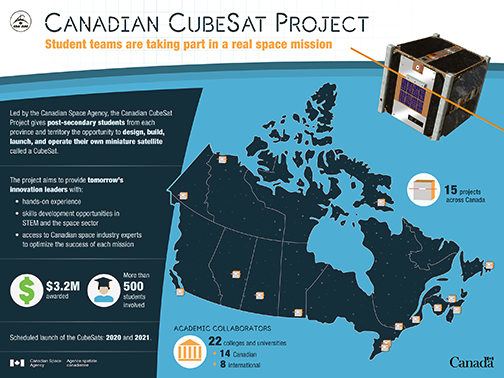 The Canadian Space Agency (CSA) has recently launched a new national post-secondary student space initiative today called the Canadian CubeSat Project. Via the Canadian Space Agency’s YouTube channel from Winnipeg, astronaut Jenni Sidey unveiled the teams — including UVic’s — that have been selected to participate. A total of 15 collaborative teams composed of 36 organizations will participate in the CubeSat project. The teams will operate their satellites and conduct scientific experiments for up to two years. University of Victoria students, who won a contest involving universities across Canada, work on a smallsat. Photo is courtesy of THE CANADIAN PRESS/HO (The Canadian Press). A cubesat is a cube-shaped satellite measuring 10x10x10 cm. UVic’s project is a two-cube unit. Dubbed “OrcaSat,” the Optical and Radio Calibration for Atmospheric Attenuation Satellite (ORCAASat) is a joint project between the UVic Satellite Design team (a collective of undergraduate and graduate students from the faculties of engineering, social sciences and commerce), UVic engineering and astronomy faculty supervisors, along with collaborators at Simon Fraser University and the University of British Columbia. Once in orbit, a laser light being emitted from the satellite will act as a kind of artificial star to better calibrate ground-based optical telescopes. The UVic team estimates it will increase the accuracy of telescopes such as UVic’s—one of Canada’s biggest on-campus telescopes—by more than 10 times. ORCAASat will have a number of potential photometric (light-measuring) applications in atmospheric and climate science as well as long-distance space communication. But because photometry is one of the most widely utilized forms of measurement across the entire astronomical field, the small and relatively inexpensive satellite will become a vital and free tool for astronomers and cosmologists around the world. By improving the accuracy and precision of measurements of events such as supernovae—the light explosion of stars—for example, astronomers can more accurately measure how far away it is and therefore how far back in time it happened. This will enable cosmologists to make better estimates about how fast the universe is expanding and uncover some of the mysteries of dark matter. The Canadian CubeSat Project incorporates young, innovative Canadians who will take the Canadian Space Program into the future. What better way to learn about space engineering than to design, build, launch and operate your own satellite? Post-secondary students from each province and territory have won the chance to design, build and launch into space their own CubeSat through the Canadian CubeSat Project. 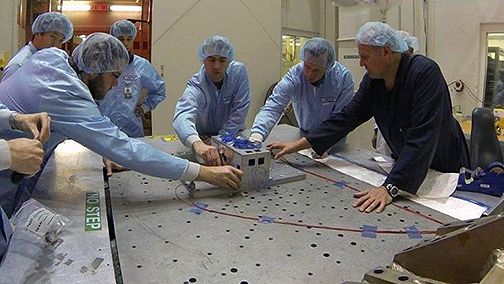 The opportunity to work on a real space mission from start to finish, including operating the satellites and conducting science experiments in space, will help students learn about science and engineering. It will also give them useful experience and skills in project management, leadership, marketing and communications. This will equip them well for the jobs of the future. CSA experts, as well as representatives from the Canadian space industry, will guide the teams throughout the Canadian CubeSat Project, to optimize the success of each mission. This initiative is part of the Government of Canada's Innovation and Skills Plan, a multi-year strategy to create well-paying jobs for the middle class.